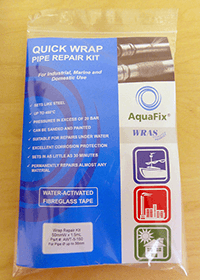 AquaFix Quick Wrap water activated fibreglass tape Kits can repair almost any kind of leaking pipe or hose, it works on steel, copper, aluminium, galvanised,all plastics, rubber and even concrete.The unique resin impregnated bandage is simply removed from the sealed foil bag and submerged in water for 30-45 seconds to activate the special adhesive. After plugging the hole or crack with the Quick Steel Putty the bandage is simply wrapped over the affected area to form a strong and permanent repair.It can also be used for encapsulation, corrosion protection and joint ‘strengthening’. Quick Wrap can operate at high pressures and temperatures ( 20 Bar/480°C ). All can be made without any tools.applications Quick Wrap kits are available for pipe diameters from 6,35mm ( 1/4” ) to 508mm ( 20” ).High pressure repairs require a minimum of 8-10 wraps around the pipe circumference. For non-pressure repairs, 4 wraps will be sufficient.